Just curious if anyone knew what NPS Programs are currently available for IW's currently. I thought it was just Computer Science, Information Warfare, and Electrical Engineering but then I saw a brief where more/different programs were listed. Just trying to find ground truth - thanks! Many IWOs attend the Naval Postgraduate School to complete a Masters Degree in the Electrical Engineering, Computer Science, Information Warfare and Regional Studies curriculums. Is there any statistics that say how many IWOs get a specific degree at NPS? I'm wondering if more IWO's get a IW or CS degree. Also, how fast after OCS can an IWO attend NPS? If I had to guess it would be a year after IWBC. OneShot wrote: Is there any statistics that say how many IWOs get a specific degree at NPS? 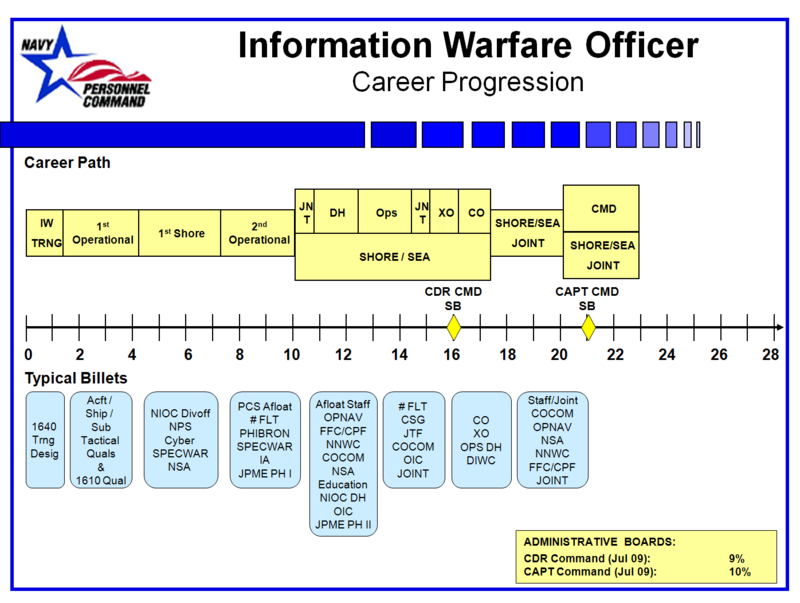 I'm wondering if more IWO's get a IW or CS degree. Also, how fast after OCS can an IWO attend NPS? If I had to guess it would be a year after IWBC. In reality attending NPS would have to wait until the initial tour in the community is complete. You have to factor the time required to complete your IW and IDWC PQS and gain some experience on the national side. 1610MATROS wrote: Many IWOs attend the Naval Postgraduate School to complete a Masters Degree in the Electrical Engineering, Computer Science, Information Warfare and Regional Studies curriculums. Thanks for the information. That makes much more sense. So according to this timeline (credit to I Like the Cut of His Jib) and your opinion, where would you think that would be? Between year 4 - 6 ? I'm just trying to picture a couple of years in advance as best as I can. OneShot wrote: Also, how fast after OCS can an IWO attend NPS? If I had to guess it would be a year after IWBC. Recent passdown from the detailer is that you must complete an operational tour before he will send you to NPS. Assuming you spend 3 years at a NIOC and then 2 years doing some sort of 'operational tour', you are looking at 5 years post OCS. A good discussion to have is what defines an 'operational tour' in our community. Thank you very much; 5 years isn't bad at all. I would absolutely LOVE to spectate an informed conversation about "what defines an operational tour." I love learning about this community. Pwlk wrote: A good discussion to have is what defines an 'operational tour' in our community. Whatever satiates our deep-seated daddy issues, manifested through an irrational craving for SWO abuse and approval. Three years flying in my initial tour satisfied the operational tour for me. You don't necessarily have to do another 2 years post-first tour.